For the past two months, I went through a very bad acne outburst phase. And when I say bad, it means BAD. So, with my knack for researching, I googled trying to find a cure or maybe at least some home remedies to treat my acne. But, a multiple trial and error and I gave up. We know how pimple popping is more than just satisfying, hence the 'habit' left me with very bad scares on my forehead and chin, also I noticed more acne than I had in the first place. Finally, a visit to my dermatologists came to my rescue. She prescribed some medication i.e. face wash (I am coming to this), some anti-acne ointments, and a few capsules to take. Obviously, I had to religiously follow the skin routine treatment, but in the hour of everything, there was this thing which I discovered… it was the face wash (Yep, the point of this blog, TBH) which I can give the entire credit to. AKA presenting to you my fountain of youth in a face wash (I am exaggerating a lil bit.) Ahaglow. I read a lot of good review about this particular face wash, but you never really believe until you use them. Am I right? So, after using it for almost 2 months, I can say, ‘I wish I'd used it way before I went through the pang of popping the pimple and scarring my face.’ Sigh. But, they say, you never learn until you make a mistake, so yeah. 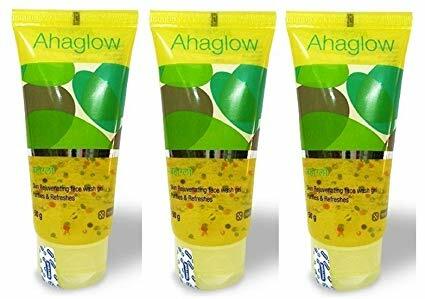 I also thought why not review my experience and let you guys know how Ahaglow works just like a miracle. The face wash comes in a simple transparent yellowish tube, and it is a gel-like texture with tiny colourful micro-beads. The beads are supposed to exfoliate and keep your skin fresh. It has a mild smell, the texture is gooey and it does not lather much. After using it, it proved to be what it mentioned on its package. It does not leave your skin dry and gives you a fresh and clean result. My skin has never felt so clean and supple, it also gives you an even out skin tones which I notice with all my pimple scare disappearing. The face wash lathers very mildly, so you must massage it on your skin properly so that it covers all the face and neck area. It controls your pores from more outbreaks and cleans the dead skin cell, unblocking and cleansing the pores. This is one face wash which I am never going to change for a while, at least. I would surely love to recommend this to those with acne-prone skin. However, to be safe, kindly approach your dermatologist before using. The only con of the face wash is that it is a little pricey from any usual face wash, maybe it is the price worth paying for a glowing, acne free skin. Wink! 100 % soap free rejuvenating face wash gel formulated with natural foaming ingredients, cleanses, protects and hydrates the skin, keeping it soft and rejuvenated. Aqua halo technology with more than 80% purified water and plant-based natural surfactants help in keeping skin moisturised, it is mildly antiseptic and maintains the pH balance of the skin. It has Biodegradable ingredients, free from parabens, sulphates, formaldehyde & synthetic colours. Squeeze the desired amount onto the palms of your hands and gently massage it over your face for 1 minute and rinse-off with water. Do let me know if you have any anti-acne face wash which you swear by. P.s- This is not a sponsored post. All the opinion expressed are my own.